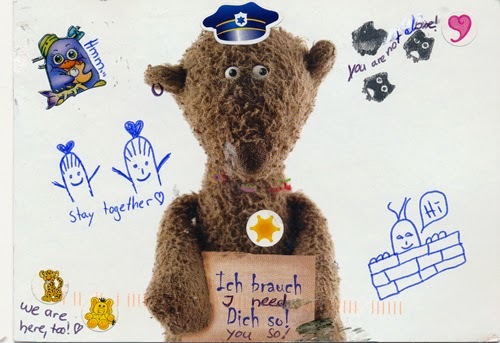 A German postcrosser created a cute story about a lonely Teddy Bear. 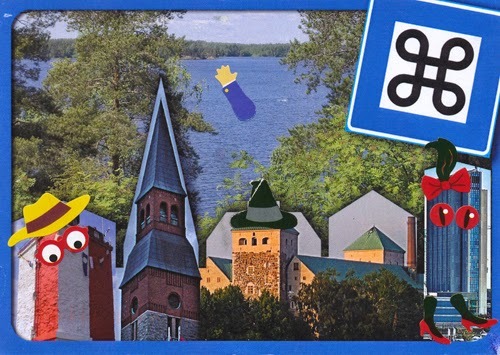 A Finnish postcrosser created characters out of buildings and the lake. I love her imagination! 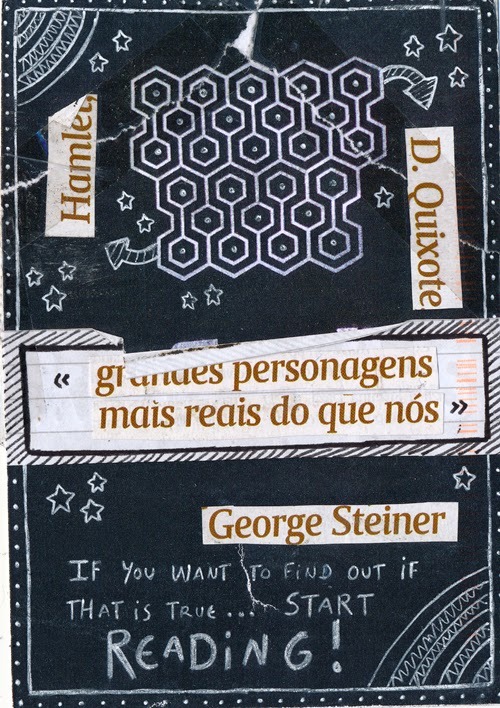 Here's an altered card that speaks to the Portuguese postcrosser's love of reading. She explained the the quote means, "Great characters are more real than ourselves." Indeed, I love books that have good character development. 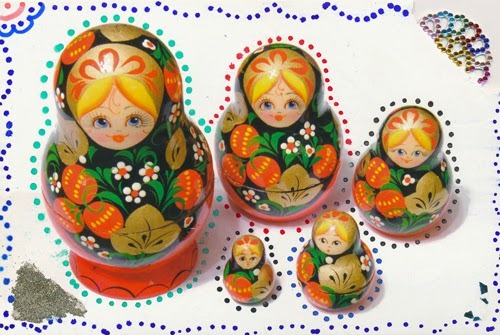 Anna, a prior postcrosser, sent a lovely altered card with Russian nested dolls. I love the way she decorated this card with markers and a pretty ornament on one edge. I will have to send her a nice altered card in return. 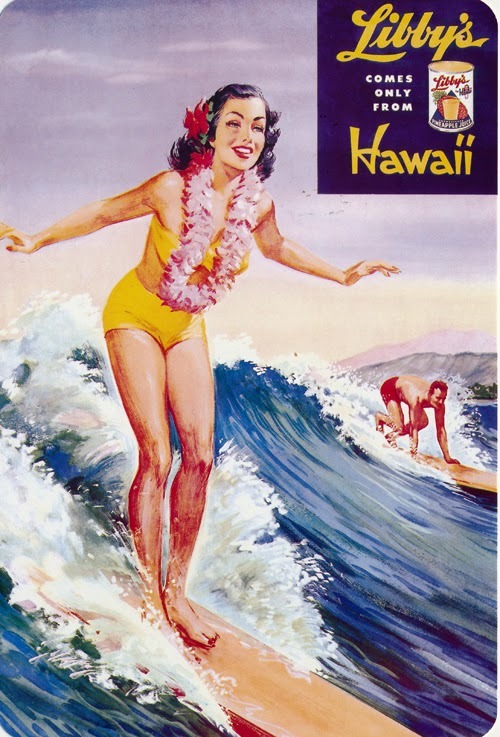 Three retro Hawaiian cards to postcrossers living in wintry conditions. 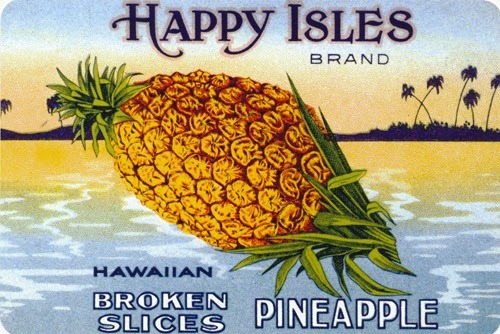 The pineapple goes to Belarus, The surfer goes to Canada and the lei-maker goes to Germany. All cards from WES. Another find at the WES! This was in a box of movie poster cards from MOMA. 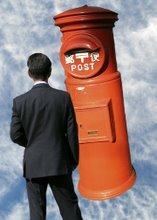 It is going to a young postcrosser in Taiwan who is majored in radio, TV & film and now works in radio. 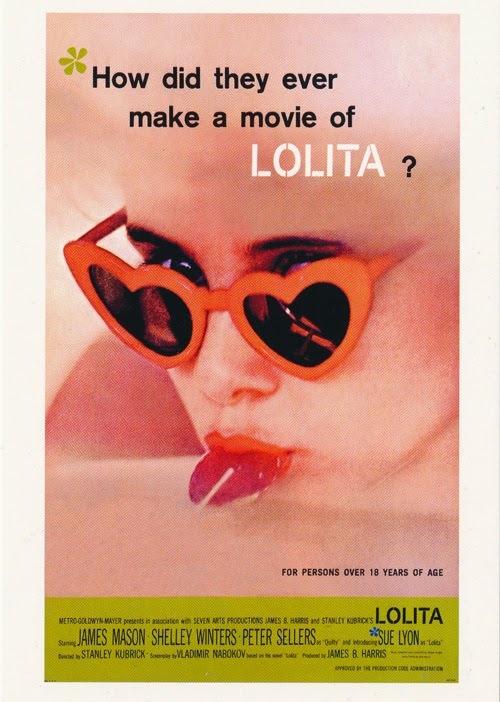 Working in a slowing fading field, she may appreciate Nabokov's novel and the luscious image of this Stanley Kubrick-directed film. Picked up this fabulous card yesterday at the White Elephant Sale. I had forgotten how svelte these women were back in the day. 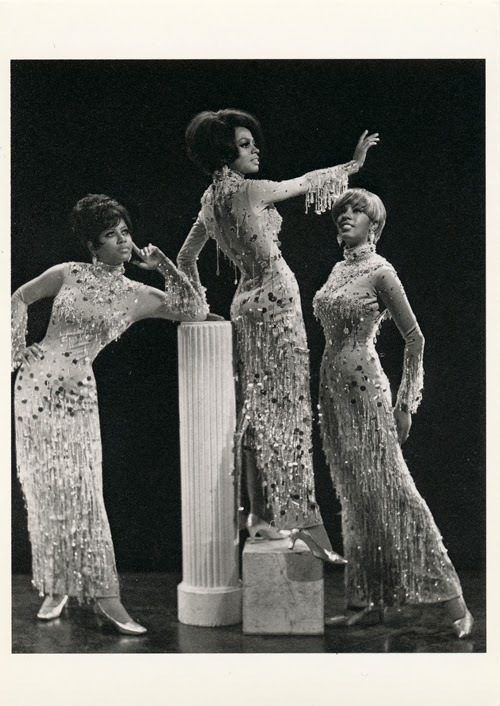 It is going out today to a Postcrosser in Belgium who likes Motown. I hope she enjoys this card as much as I do. Creativity Explored's announcement of Daniel Green's solo show. 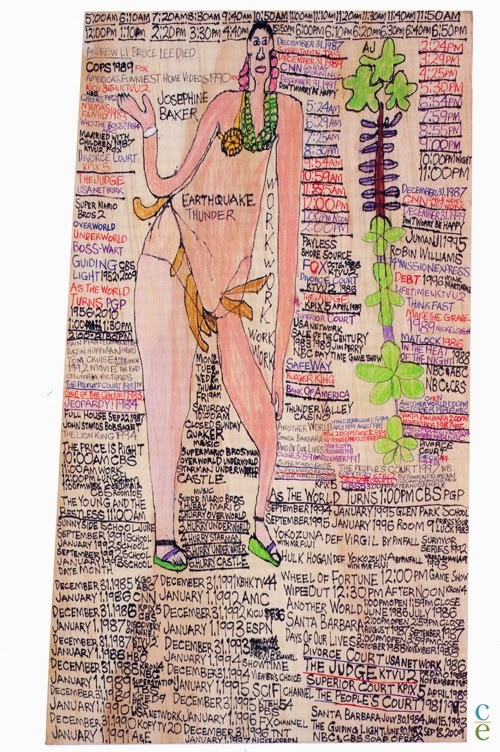 He makes meticlous lists remind me of the old TV Guide. I own several of his works. The opening reception is Jan 15, 7-9 pm at 3245 16th St, San Francisco. I received this lovely handmade New Year card from Riko. She used joss paper, paper ephemera and rubber stamps to create a lovely design. My mother's Christmas package had my favorite 2015 New Year stamps on it. Famous Japanese artists and calligraphers are asked each year to create their interpretation of the word, "sheep." 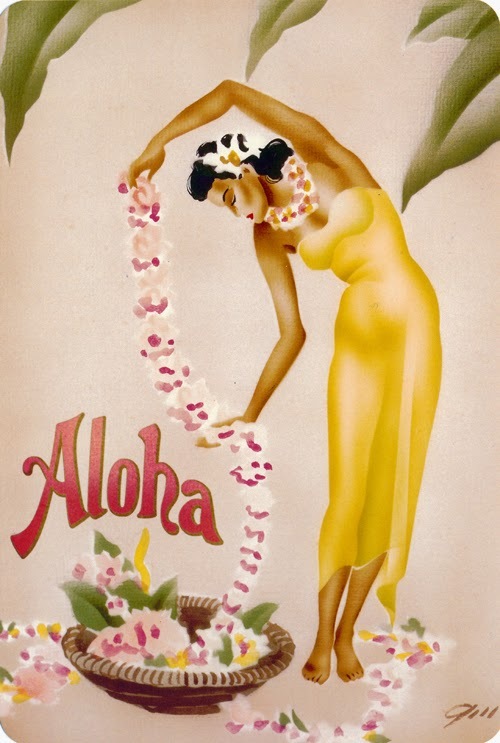 Some are modern and stylized while others hark back to ancient crypographs. 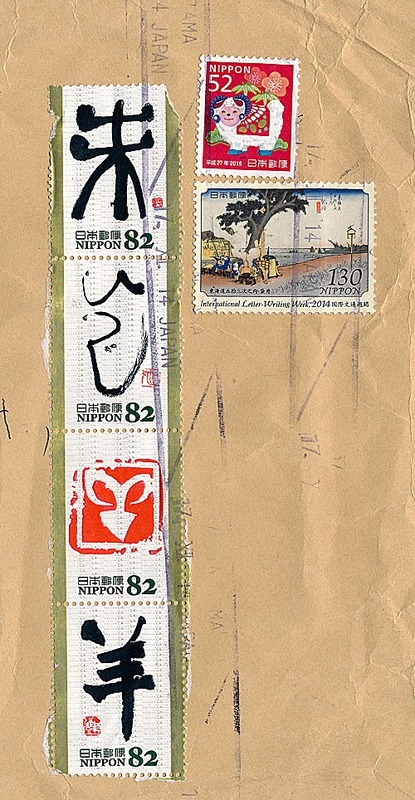 The red ones connote seals rather than calligraphy. This zodiac animal is associated with gentless and I hope this year brings plenty of that!